I used to feel envious of other people a lot, but I didn’t recognize envy for what it was. Then one day I watched a bunch of little kids preach at a youth conference. Instead of being happy for them, I got upset with God. (#Facepalm) I wanted to preach; why couldn’t that be me? At that point, I recognized this ugly sin of envy in my life. I took it to the Lord and read a book on the subject. (The book is Envy: The Enemy Within: Overcoming the Hidden Emotion That Holds God’s Plans Hostage by Bob Sorge [affiliate link].) This book is awesome and really helped me. In this book, Bob Sorge says that envy–“the biggest sin nobody has”–is when we despise the gifts and the call the Holy Spirit has given to us, and lust after someone else’s instead. Basically, if I envy someone else’s gift, that essentially means I don’t value the gifts the Holy Spirit gave to me. I don’t respect the Holy Spirit as being wise enough to know what’s best for me and when. Instead, I only want someone else’s calling and opportunity. Just writing this brings tears to my eyes. For so many years, that is how I treated the Holy Spirit. Lord, I’m so sorry. The Holy Spirit is so precious, so wise, so generous. I’m so sorry that I grieved and insulted Him like that. But now, thus says the LORD, who created you, O Jacob, and He who formed you, O Israel: “Fear not, for I have redeemed you; I have called you by your name; You are Mine” (Isaiah 43:1). Out of this verse, the Lord spoke to me that He has made me to be what I am; He made me just the way He wants me to be; and He made me especially for Himself. I’m special to Him, and He considers me as belonging to Him. The Lord is speaking this verse to you too. He made you to be what you are; He made you just so, just how He wants you. He made you especially for Himself. 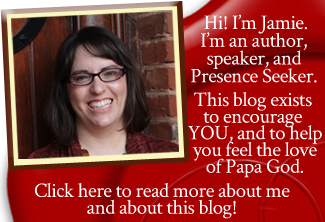 You are special to Him, and He considers you as being His special possession. that He loves me, and won’t let anything get in the way of His perfect plan for me. He is with me and I don’t have to be afraid of getting skipped over. He made me to be His witness, and He’ll ensure that I fulfill that calling. I’m His servant. He chose me especially, that I may know Him. Knowing Him is my primary calling, and I can rest in the understanding that as long as I know Him, I’m doing exactly what He wants me to do. Related: Stop Expecting the Church to Promote You and Ready For God To Promote You? 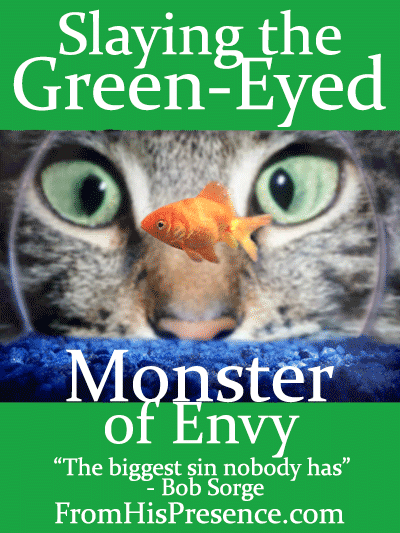 Realizing that the same thing applies to you will help you slay the green-eyed monster of envy too. The Lord loves you with an everlasting love. You don’t have to be afraid of getting skipped over. He will ensure that you get the opportunities you desire–and even better opportunities, in my experience–when the time is right. You are His servant. Our Father God chose you especially, just to know Him and be with Him. You are fulfilling your calling as long as you are pressing into Him. He will bring everything else into being at just the right time. If you will take the time to really get these truths in your spirit, you will see that envy is not only sin, but a complete waste of time. The Holy Spirit has given you special gifts. He knows you more intimately than anyone else could ever know you. Your Papa God knows just what He’s doing in your life, and you can trust Him. He will bring you opportunity to fulfill your dreams when the time is right. He made you His servant; He has chosen you. He will ensure that you fulfill your calling, and you won’t miss it. Do you worry that you are missing your call? Cling to God. Seek Him, and He will lead you into your calling perfectly. Thank you, Ms. Judy! Love you! As always Jamie, you were spot on! I love what you’ve done with the website btw!! Makes me want to skip work and read every post ?? WOW! What a relief. I’ve been so waiting to hear his voice. Now I can relax and just enjoy the journey. Love this! Thanks Jamie.